The 33-year-old Frenchman wins his 17th ATP Tour career title, his first since 2017. Jo-Wilfried Tsonga won his 17th ATP Tour career title at the Open Sud de France in Montpellier. The 33-year-old Frenchman, who entered the main draw with a wild card, beat countryman Pierre-Hugues Herbert 6-4, 6-2 in Sunday’s singles title match. Tsonga didn’t face a break point and capitalized on three of his own four chances to secure victory in one hour and 13 minutes. 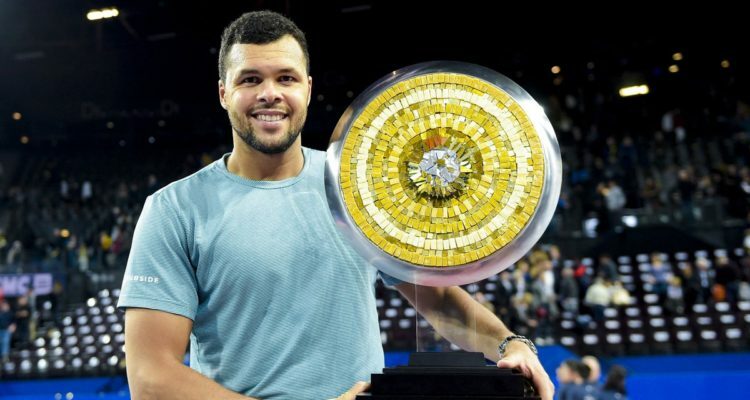 This is Tsonga’s first ATP Tour title since Antwerp in October 2017. The World No. 210 celebrated his first triumph at Montpellier after losing in semi-finals to eventual champions in all three prior appearances (2010, 2017-18). Tsonga has become the lowest-ranked titlist since Pablo Andujar lifted the Grand Prix Hassan II trophy in Marrakech 10 months ago. Seventh seeded Herbert, competing in his third ATP Tour singles final, was aiming to lift his first singles trophy. Earlier in the day, top seeds Ivan Dodig of Croatia and Frenchman Edouard Roger-Vasselin captured their maiden team title, defeating the all-French combination of Benjamin Bonzi and Antoine Hoang 6-4, 6-3 in the doubles final. The encounter lasted one hour and nine minutes. This entry was posted in ATP Tour, ATP Tour News and tagged ATP Tour, Jo-Wilfried Tsonga, Open Sud de France.